One aspect of the chainsaw world that I have always wanted to try my hand at is chainsaw carving. Of course the first step down this road to chainsaw carving glory is the purchase of a chainsaw suitable for use as a detail saw. I had narrowed the quest down to three main contenders: the Stihl MS 170, the Stihl MS 193 C-E, and the Echo CS 370. All three saws are viable contenders for a first time carver. The MS 170 is the most economical and quite light; the MS 193 C-E is the lightest and most nimble; and the CS 370 is the heaviest, but also the most durable with its split magnesium case. The more astute reader will have noticed the title of this post and assumed that Stihl’s MS 170 won out, and this is partly true. 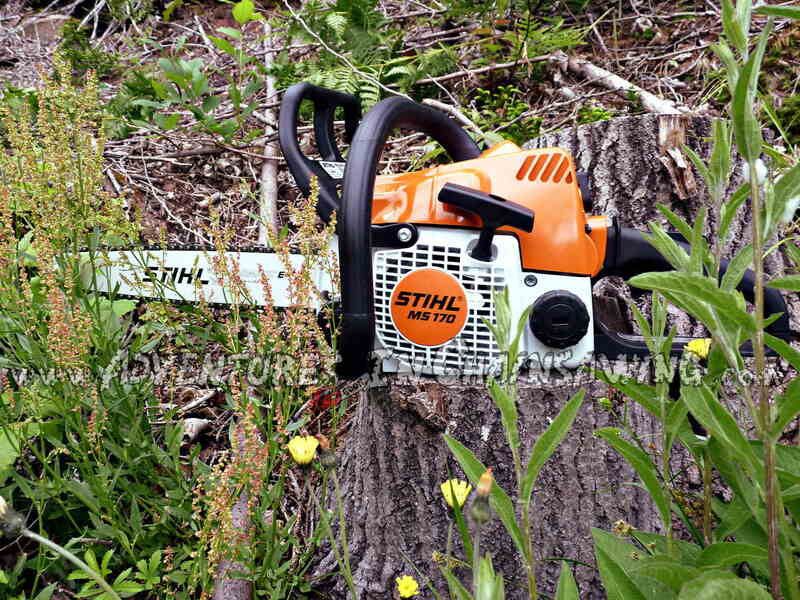 Looking and performing like a bigger saw than it is: the Stihl MS 170. Being economically minded, and considering that converting any of these saws over to a dedicated carver would cost an additional $200.00 for a carving bar, chain and rim/sprocket, I decided to give the MS 170 a try as it was light weight, had a good reputation as an entry level carver, and ,most importantly, cost exactly half of what the other contenders were going for because of Stihl’s Spring promotion which ended on June 30th. Enter the MS 170. The MS 170 feels fairly solid and is well balanced. It weighs in at around 11 and a half pounds fully fueled and comes equipped with a 16” mini bar and picco chain. The MS 170 also still sports the older non strato engine, and I do love the older engine style’s more “rumbly” sound. The MS 170 is an older design in the Stihl line-up, and, as such, it sports the older style gas and oil caps that are slotted for opening and tightening with a scrench. There are many who prefer this older style of cap as the newer “flip top” caps are more susceptible to breakage at the hinge. If I ever break one of the flip tops, my opinion will definitely change, but as of right now, I marginally prefer the newer style for its slight edge in convenience, but, from a durability/reliability perspective, the older style is superior. The air filter in the MS 170 is a little on the slight side, but that opinion is based solely on the look and feel of it, and not on actual performance. 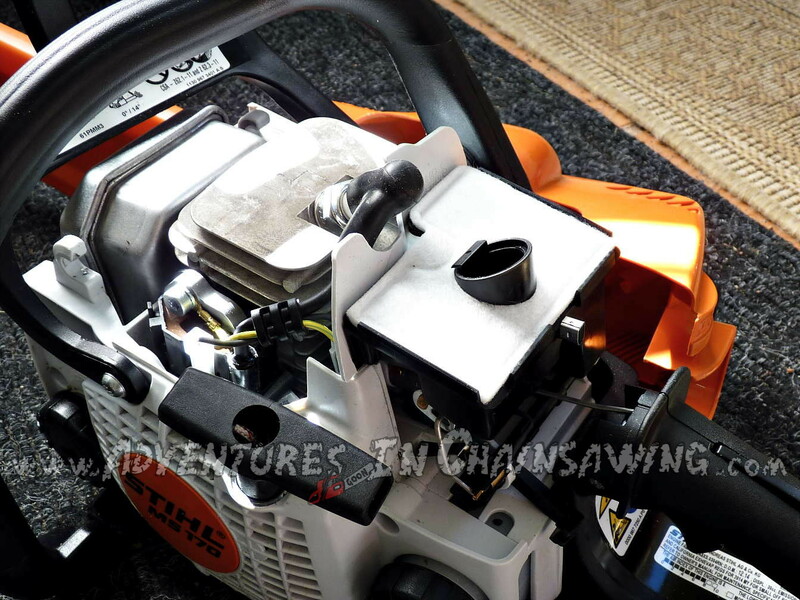 A close up of the Stihl MS 170 air filter. Before starting the saw, I decided to check the saw’s oil tank, fuel level, and chain tension, and it was a good thing that I did. The dealer had filled the fuel tank, but not the bar oil reservoir. Not a good sign. I am learning that it is not wise to assume the dealer is doing what they are supposed to be doing. The Stihl MS 170 fired up with out any issue and for a small saw with a tiny bar and chain, it was an impressive cutter. The small chips just flew as this saw cut through the small birch trees that I felled. The saw did not bog in the cut (although I didn’t force the saw-I let the saw do its work). The MS 170 was also an able limber. Its light weight and good balance came through limbing some spruce and cedar trees. The cutting performance of this small saw was impressive. 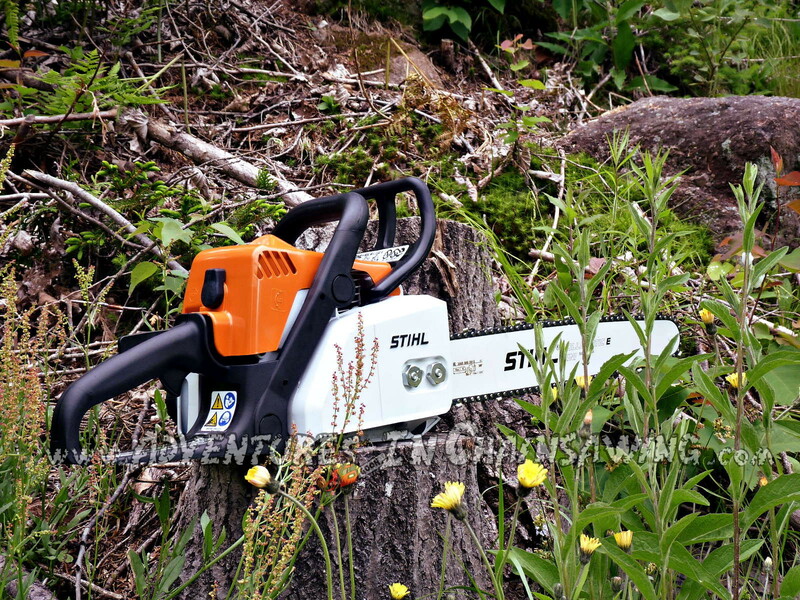 Stihl’s MS 170 is a handsome and able performer. One feature of this “tried and true” model’s older design was its front chain tensioning screw. Locating the chain tensioning screw on the front of the saw is inconvenient as it forces you to come into close proximity with the chain, and it is a little harder to keep the scrench in the slot due to the ergonomics involved. Another drawback to the MS 170 is its non-adjustable carb (only an idle adjustment screw is accessible to the operator), and it is this “feature” that would quickly sour my relationship with this more than respectable entry level saw. After the saw was thoroughly warmed up, the throttle response would become extremely sluggish. The saw would start to bog down as soon as it was given full throttle- a sound that usually prompts a quick check to verify that the chain brake is off. In this case, the brake was not engaged. The lag in throttle response was sometimes a second or more between engaging the throttle and engaging the chain. This created a dangerous condition as you could never be sure when the chain would begin spinning. Something was obviously wrong with the fuel delivery system. A strong, light-weight cutting machine: the Stihl MS 170. I decided to check the saw with a tachometer. As This was the saw’s first tank of fuel and the engine had yet to be fully broken in, I was hesitant to go full throttle too long, but the saw was taching at over 16000 RPMs. How much over 16000? I don’t know as I didn’t want to go WOT for too long. It was obvious that this saw was running much too lean. Since the saw was brand new, a trip back to the dealer was in order. Sadly, the dealer’s tech was less than helpful as all he did was fire the saw up, blip the trigger a few times and tell me there was nothing wrong with the saw. I informed him that there indeed was a problem with the saw, that it manifested itself after it was warmed up, and that it was taching well over its max RPM. Instead of checking the saw, he proceeded to lecture me on how you shouldn’t run the saw at WOT until it is broken in. This was pretty insulting considering he had “warmed” the saw up by bringing it up to full throttle several times in front of me. I do not understand why techs get so defensive when a customer tells them the saw is not performing well; it’s not like he built it. Why would I make that up? It was at this point that I stopped dealing with him and returned to the salesman and invoked Stihl’s Satisfaction Guarantee. I ordered Stihl’s MS 193 C-E. If the guarantee was a money back guarantee, I probably would have gone to the Echo dealer and purchased the CS 370. Unfortunately, in an effort to save a couple of hundred bucks, I was locked in to buying a Stihl. In the dealer’s defense, the salesman was great to deal with and didn’t bat an eye when I told them to keep the MS 170 and get me the MS 193 C-E. I guess I will give them another chance. I do feel for the person who ends up with that saw as it is probably destined for a short life. In conclusion, the MS 170 had many great qualities, and if the dealer had addressed the problem with this particular saw, I would still have it, and would be quite happy with it. The problem of saws being set too lean at the factory to meet E.P.A. requirements is fairly common. There were many things that could cause the problems I was experiencing, none of which are fixed by starting the saw, the engine a few times and declaring it “fine”. Maybe I am old fashioned, but if a customer tells you something is happening, then something is happening, and it is the tech’s job to find out what is causing that “something”. 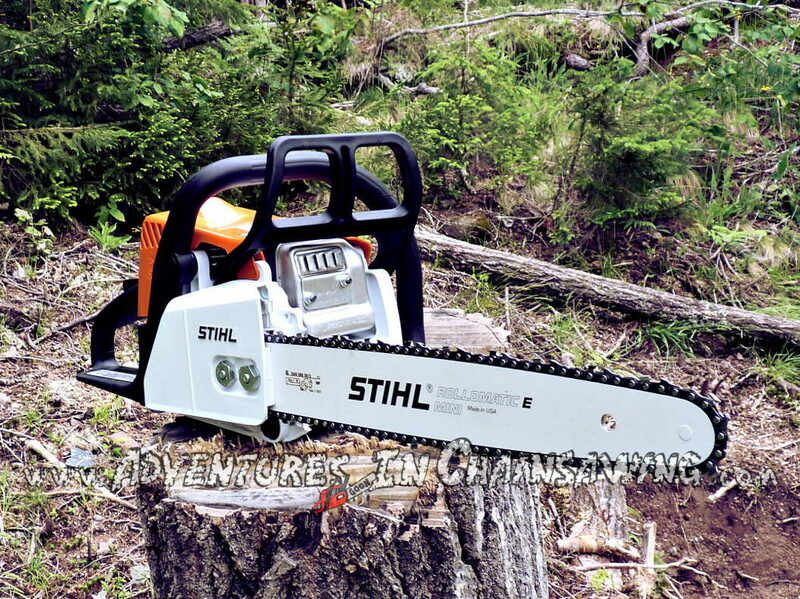 This entry was posted in Choosing a chainsaw, Reviews and tagged Chainsaw, Review, Stihl by A.J. Kilpatrick. Bookmark the permalink. Many carvers use the MS 170. To use the smallest radius carving bar, you would have to change to 1/4″ sprocket, but if you wanted to try carving with a quarter tip (1″ radius tip), you could use a 3/8″ low profile chain which uses the same sprocket. I don’t know if there would be much advantage to using an 8″ bar over a 12¨for someone just starting out. The smaller bar might make sourcing a chain more difficult. Going with a .050 gauge bar would allow you to run a specialized carving chain which is made entirely of cutting links. Oregon’s smallest bar is a 10″, I believe. DVD’s and books seem to be a bit scarce. As to tools, most recommend a medium to large saw (40 cc and up) for blocking, or the rough cutting in addition to a small detail saw. Carving bar’s are expensive and delicate, so the less you use them, the longer they will last, especially the dime tips. You might want a detail sander and/or a 1/4″ die grinder as well as a torch to get up and running. The side chain tensioning assembly from a MS230/250 will fit in place of the MS170 front tensioner. I did this conversion on my 170. All you have to be careful about is if you get aftermarket parts, be sure you get *all* of them. Some vendors, for some reason, sell only a few of the parts. Good review. Most other web “reviews” look like a features list and promo blurb copied and pasted from sales literature. Thanks for the kind words. We appreciate them. Thanks for the tip concerning retrofitting the MS 170 with a side tensioning assembly from a MS 250. That is an inexpensive modification that definitely improves the ease of use for the operator. Keep the tips coming. I just wanted to comment on the RPM you were seeing. I think you might have had your tach set up for a 4-stroke rather than a 2-stroke. I’m guessing it connected to the spark plug lead so it’s firing on every other stroke – rather than every fourth – so the RPM is double what you should be seeing. 8000 RPM sounds more reasonable. Is ms 171 really better than 170? I’ m going to buy one but i’ m confused between 170/180 and 171/181. I want to cut a walnut tree arount 60 cm at the base. Whether the MS 171 is “better” than the MS 170 is hard to say. The main advantage of the MS 171 is that it has an adjustable carburetor which gives the end user greater control over the fuel mixture at any given time. The MS 171 uses a stratified scavenging engine that reduces fuel consumption by twenty percent while reducing harmful emissions. The MS 171’s scavenger engine also seems to need more time to warm up in order to achieve full power- it is a bit sluggish when cold. The advantages of the MS 170 are a significantly lower weight (close to a pound lighter), and lower price. Using a 32 cc saw to fell a 60 cm walnut is asking a lot of the saw. Although the MS 170/17 can accomplish the task, it would not be recommended. The MS 180/181 do give a little more power, but at a much higher price. For a few more dollars, the MS 211 would be a better value with a better power to weight ratio. If you can swing the extra cash, the MS 250 is the best value in the “homeowner” line, and it will give you the best power to weight ratio for the money. The MS 250 would also be more appropriate for felling the tree you mention. I would have to agree. The MS 170 is a real bargain, especially when it’s at its seasonal sale price.